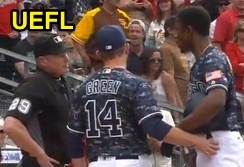 HP Umpire Sean Barber ejected Padres LF Melvin Upton Jr for arguing a strike two call in the bottom of the 7th inning of the Cardinals-Padres game. With two out and none on, Upton Jr took two fastballs from Cardinals pitcher Kevin Siegrist for called first and second strikes, before striking out on a later pitch. Replays indicate the first and second strikes were located over the inner edge of home plate and thigh high (px1 -.888, pz1 2.408; px2 -.811, pz2 1.848 [sz_bot 1.650]), the call was correct. * At the time of the ejection, the game was tied, 5-5. The Cardinals ultimately won the contest, 8-5. This is Sean Barber (29)'s first ejection of the 2016 MLB regular season. Sean Barber now has 5 points in the UEFL Standings (0 Previous + 3 AAA + 2 Correct Call = 5). *QOC would be incorrect had px been greater than |.916|. This is the 10th ejection of the 2016 MLB regular season. This is the 6th player ejection of 2016. Prior to ejection, Upton Jr was 1-4 (SO) in the contest. This is the Padres' 2nd ejection of 2016, 1st in the NL West (SD 2; ARI, LAD 1; COL, SF 0). This is Melvin Upton's first ejection since Sept 7, 2015 (Mike Muchlinski; QOC = Y [Balls/Strikes]). This is Sean Barber's first ejection since April 26, 2015 (Lloyd McClendon; QOC = U [USC-NEC]).